Click here then select to start creating your shirt. Look at the 4 images abovet. 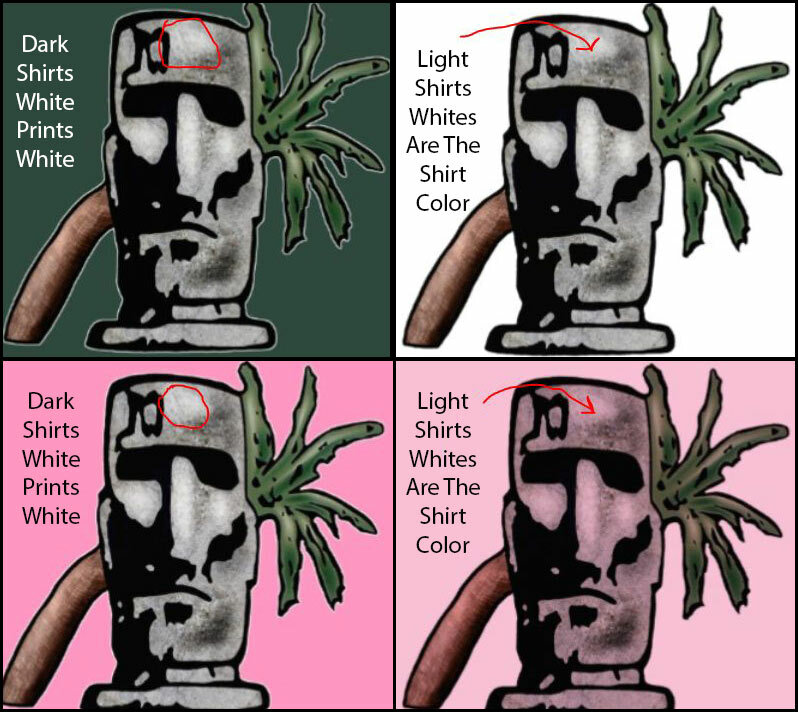 In the two images on the left side the white areas appear white and the color of the Tiki is not tinted. That's because on dark colored shirts a double printing process is used. First a white background is printed, then the rest of the image (with white transparent) is printed over the white background. This has the same effect as printing just the second image (with white transparent) on a white shirt. On light colored shirts (including white of course) a white base is not added so any whites in the image will take-on the color of the shirt. The two images to the right were printed this way. The one in the upper right appears normal because it's a white shirt. The lower right shirt, however, shows a pink tint over the entire image because the color of the shirt is coming through, replacing the whites in the image. When choosing a shirt color keep this in mind. You'll be able to see how the image will appear on the design page. You'll notice that the dark shirt colors are more expensive because of this double printing process. Sometimes it's hard to predict if a shirt color will be printed with the white background, you just have to select it and look at the result. The two images at the bottom were from the same shirt, the one on the right, with the pink tint, was simply "pink." The one on the left with the white base printed first was called "Wow Pink." On many light colored shirts this is no problem as the image looks fine. On others it doesn't look so good. In the example above I personally don't like the pink tint on the one in the lower right. Just make sure you keep this in mind. At this point-in-time there is no way to choose which way a shirt will be printed but at least you'll be able to see the result on your monitor.